Thank you to Spellbinders for sponsoring this post. I only recommend products that I use and love and all opinions are 100% my own. This post contains some affiliate links for your convenience. Click here to read my full disclosure policy. I used this perfect spring colored tissue paper pack. 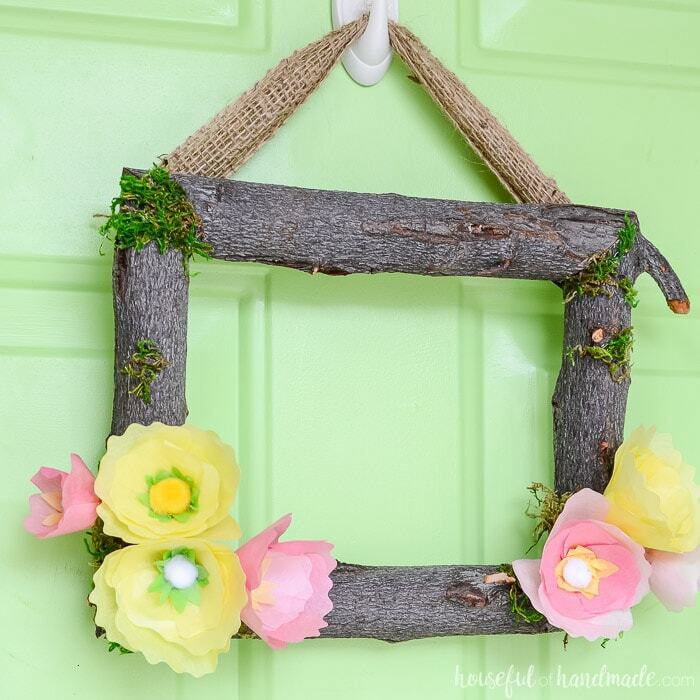 You could also make a frame with reclaimed wood or use a wreath form. I used branches that were trimmed off a tree. My branches were about 1 1/2″ in diameter. 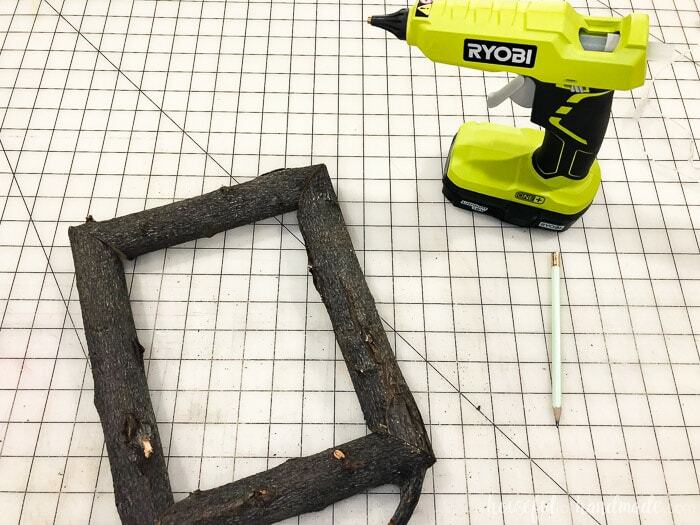 Cut 4 pieces of branches so they are at a 45 degree angle on the outer ends (like a picture frame). Cut 2 that are 14″ long and 2 that are 10″ long (or whatever size you want for your front door wreath). 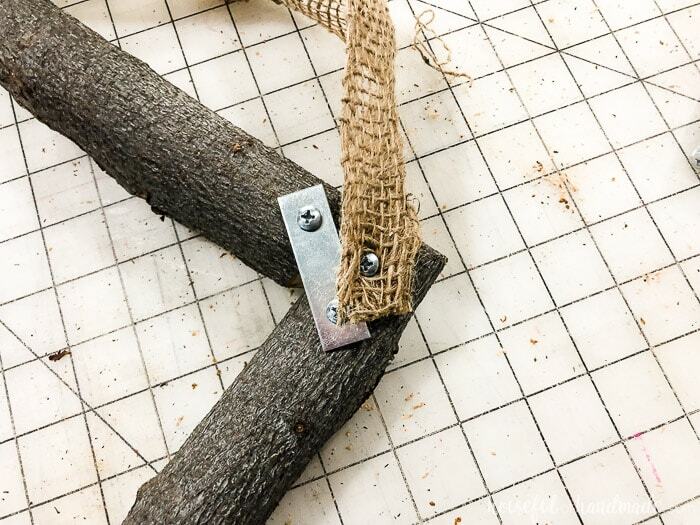 To secure the logs into a frame shape, start by hot glueing the corners together. This is great because it dries quickly (and this round/odd shaped logs like to move around a lot). Make sure the fronts of the frame line up as nicely as possible, but don’t worry about perfection because the moss and flowers are great for hiding weird corners. Once you have the logs secured with glue, turn the frame over and secure with mending plates and wood screws. The hot glue will not hold the wreath together on it’s own (you can read about how I learned about that here). My branches were very hard, so I predrilled pilot holes for the screws. 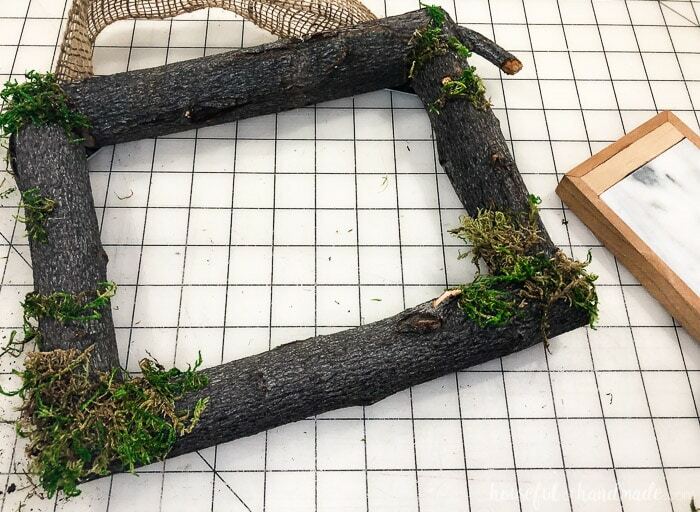 Attach a piece of ribbon to the top corners of your log wreath frame. I used burlap ribbon. 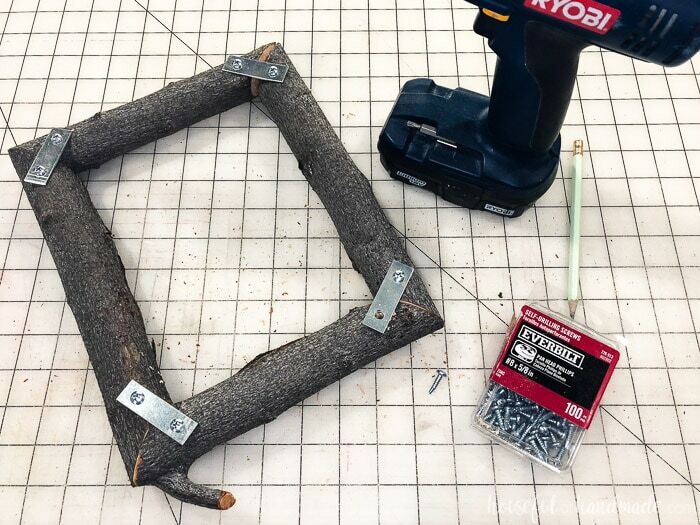 Attach it with hot glue and a screw so that it can support the full weight of the log wreath. Turn the wreath frame back over. 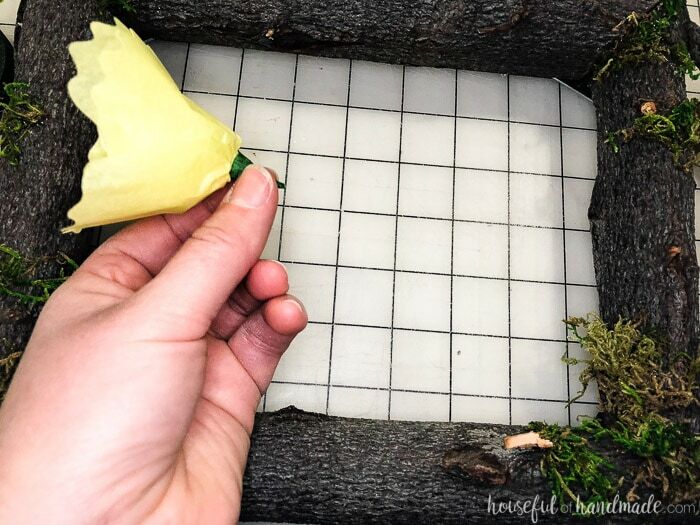 Use the hot glue to add moss to the corners and randomly over the frame. The moss is messy and falls apart easily. I used a good amount of hot glue, but make sure not to burn your fingers and use an old pencil to push the moss onto the glue. Cut squares of the tissue paper in the colors you want. I cut the entire stack of the color I wanted (about 6 layers) and then folded it in half so I was cutting 12 layers of tissue paper on each pass. Lay the steel rule die on top of a cutting plate, then lay the tissue paper over the shape of the petals on the steel rule die. Top it off with the second cutting plate and run it through the Platinum die cut machine. Cut out a coordinating color of the star shaped part of the die too. To assemble the flowers, add hot glue to the back of a pom pom and stick it to the center of one of the star shapes. Press the points of the star up around the sides of the pom pom. Then add more glue to the back of the pom pom piece and repeat with a second star shaped piece. Cut a piece of floral wire. It only needs to be a few inches, long enough to hold onto, but most of it will be cut off in the end. Using the pliers, create a little circle on the top of the wire, then twist it so that it is flat on the top. Add a bit of hot glue to the wire circle and stick it to the bottom of your pom pom piece. Use the smaller petals for the inside of the flower. Add a tiny bit of glue to the bottom of a petal and pinch it around the wire under the pom pom center. Add a second petal and pinch it around the wire about 1/4 turn away from the first. Repeat with 2 more petals until you have surrounded the center. Add more if you want the center fuller. Some flowers I added 4 center, some have 6 centers, and one has 8. Just depends on your mood. Then repeat with the outside petals. Start with 4 and add more if you want. 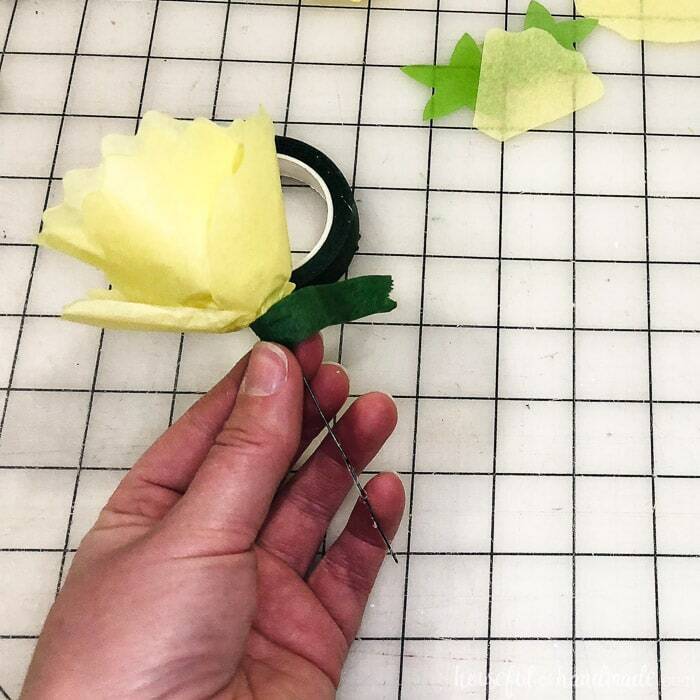 Once you are happy with how full your flowers are, wrap the glued ends with a little bit of floral tape. This will finish off the flowers very nicely. 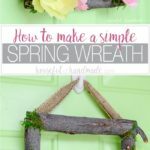 Make as many flowers as you want for your spring flower wreath. I also made some to look like they were just blooming by just using 4 inner petals and keeping them closer around the center pom pom. 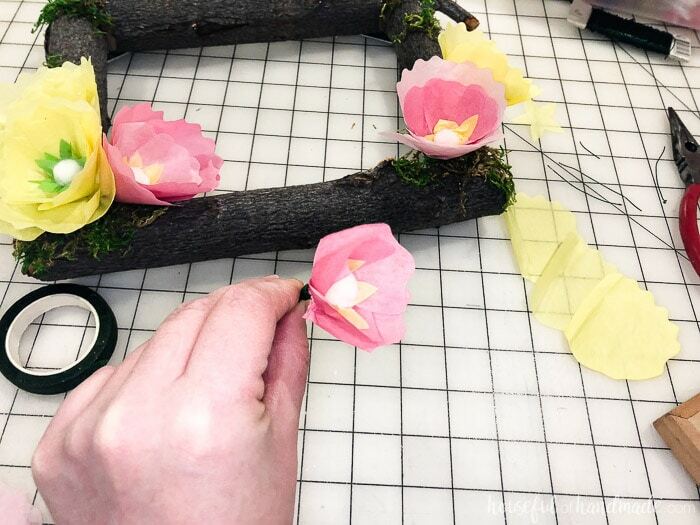 To attach the flowers to the log wreath form, cut off the extra wire and add hot glue to the floral tape part. Press it onto the wreath where you want it and hold until the glue dries. Attach all your flowers and hang it up! Now your home is a bit more like spring with all those beautiful flowers, even if it is still snowing outside. This came out great! I just recently made a couple of small wreathes out of a vine-y (is that a word?) weed that was taking over the back part of the yard. I’m so pleased that I can literally make a treasure out of trash, and I love finding your post and to discover that I’m not the only one. Question about your glue gun – in the post, you link to just about the same one I have, and I hate it because it falls over all the time. But in the photo, it looks like you have a Ryobi one that appears to be rechargeable batter powered? I didn’t know that existed. Do you like it? I love that you made a wreath out of the weedy vines. Yay for free! I actually made a wood glue gun stand to hold my glue gun up because yes it falls over a lot! I’ve had it for years and it still works great, I bought new ones that didn’t work very well at all. The Ryobi one is great. I just got it for Christmas. It is a large glue gun so I use it for big projects and the mini one for smaller ones. The Ryobi one does burn through batteries if I leave it on while taking my time to craft, but I have 4 so it’s not a big deal.